Enter your goals and include educational, training and/or resources you need to reach that goal and finally enter your desired outcome in regards to your goals. 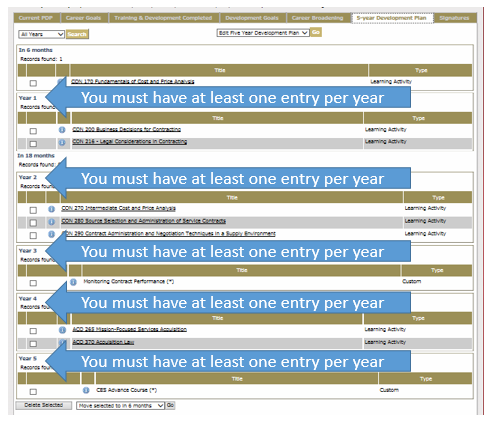 Notes: You must have at least one entry for each year in your 5-year Plan. Click on the tab 5-year Development Plan to choose Learning Elements to add to your IDP. Edit your 5-Year Plan: You may remove items (as needed) by clicking on the box next to the title and click the Delete Selected button at the bottom of the page. Move selections around once you have them listed by clicking on the box next to the title and choosing what year to move them to from the dropdown (on bottom) and click GO. You can also add Installation Specific Learning elements by clicking Edit Five Year Development Plan and click the tab Add Custom learning elements, type in the name of the training (i.e. POSH, AT-Level 1) and click Add. Click Return to see it on your 5-year plan. Make sure your supervisor’s information is correct (if it’s not have them update their profile). Click here to download full instruction on how to manage your IDP.